Aaron Bull, multiple award recipient and current student in the Master of Rural Development program, speaks on behalf of students. 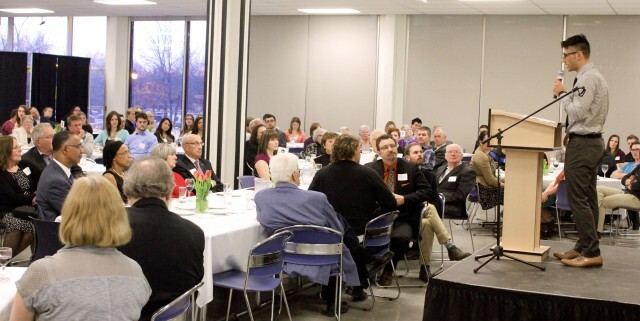 BRANDON, MB – A packed house celebrated Brandon University’s (BU) generous donors and outstanding student achievements on the evening of March 18th, 2015 during BU’s annual Awards Reception. The event connected donors who have supported scholarships and bursaries with the student recipients of those awards in the spirit of fellowship and celebration. Speakers for the evening included Aaron Bull, multiple award recipient and current student in the Master of Rural Development program at Brandon University. Bull recently completed a Bachelor of Science (Honours) with a Major in Applied Disaster and Emergency Studies, and a Minor in Psychology at BU. Joining Bull with remarks on behalf of donors was Gerald Butler, BU class of ‘63 alumnus and donor to the Seven Generations Scholarship at Brandon University. Butler shared his thoughts on the important role financial support through awards can play for students as they strive toward their full potential. So far this academic year, Brandon University has distributed more than $1.25 million in scholarships and bursaries to students in each of the University’s five faculties.